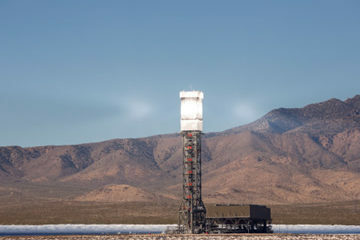 ABOUT THE PROJECT: Ivanpah Solar Electric Generating System (owned by NRG Energy, Google and BrightSource Energy) uses solar tower technology to produce clean, reliable solar electricity for more than 140,000 homes. Ivanpah is the world’s largest solar thermal power tower. Electricity from Ivanpah avoids millions of tons of carbon dioxide and other air pollutants – the equivalent of taking 70,000 cars off the road. Located in Ivanpah Dry Lake, CA, the three-year and $2.2 billion project has a three-unit power system – with a total of 173,500 heliostats – and sits on approximately 3,500 acres of public desert land. 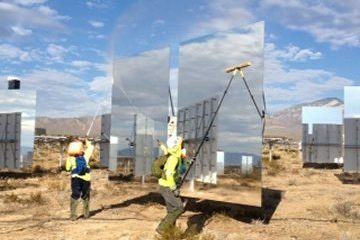 ARGUS’ SCOPE OF WORK: Argus Contracting provided mirror cleaning and collision maintenance. Shrubs had to be removed so the mirrors could be put in to mirror-washing position. This was challenging because of strict regulations regarding how much dirt one guy may remove with one shovel for one minute. Some ground collisions were not able to be cleared because regulations forbid disturbing natural washes created by monsoon flash floods. Weather was another challenge. If the winds were above 25 mph, work had to shut down so the mirrors could be put back to a “safe” (tabletop) position. Monsoons caused flash-flooding, requiring the mirrors to be put back to safe position. Lightening storms within 3 miles also required the mirrors to be put back to safe position, as they are huge conductors. Mirrors were struck by lightning occasionally, upon which they exploded with shards of glass spreading a 30-foot radius. Heat illness training was necessary due to the extreme weather conditions. Special precautions were taken to prevent heat stress such as wearing light weight clothing and long sleeve shirts. Argus crew wore Camelbak packs to keep hydrated with a minimum of 10-minute breaks every hour … with more breaks if the crew needed them. Special safety glasses were worn due to the sun rays reflecting off mirrors. Snake gators were worn because two of the deadliest snakes – Mojave Green and Sidewinder – were prevalent. Turtle training was necessary because the desert tortoise is an endangered species, and if nine of them are killed over the life of the 30-year project, the entire project will be shut down.